Rare resources; Metal, Cotton & Horses, randomly appear in certain locations on the map. 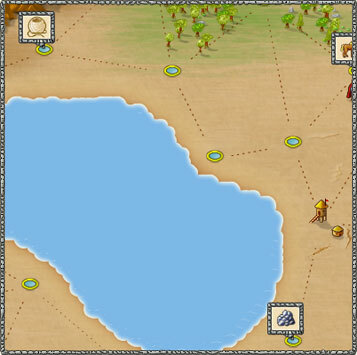 Each location where you find these resources must be connected to your kingdom in order for you to collect them. If the location is connected to your kingdom, all you have to do is move a general to a location and use the 'collect' action. Each location has a stock of resources which will become available little by little. Once stock has been depleted and all available resources have been collected, the location will return to normal and it will no longer be possible to collect rare resources. Rare resources also enable you to train your soldiers or can be converted into basic resources using various buildings. Each upgraded unit possesses various bonuses which are displayed in their description.